A quick and easy to use British Seagull® outboard spare parts guide with schematic drawings. A quick and easy to use British Seagull® Outboards spare parts guide showing schematic drawings of the parts used to build British Seagull outboard engines. The correct drawing for each engine is determined by the pre-fix letters from the complete engine serial number. 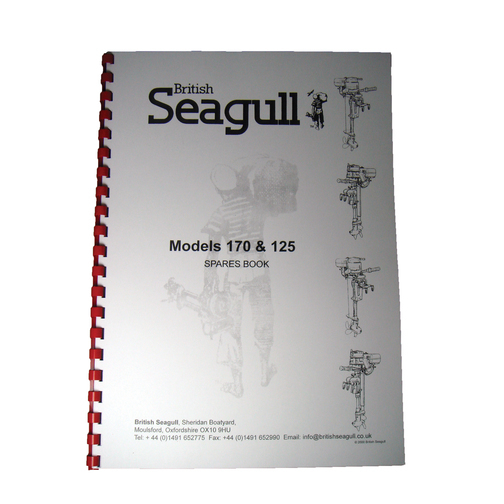 This book along with the British Seagull Outboard Model 170/125 Owners Spares Book (LIT03) is the only publication specifically produced for the Model 170 and Model 125 engines with the power-head cowling. This book is suitable for the Model 170/125 engines only; identified by the engine number pre-fix letters ENC and EN.